Colombia’s FARC insurgency has agreed to peace but could domestic politics return the country to war? The Colombian government and the Revolutionary Armed Forces of Colombia (FARC) reached a new peace deal on November 14. 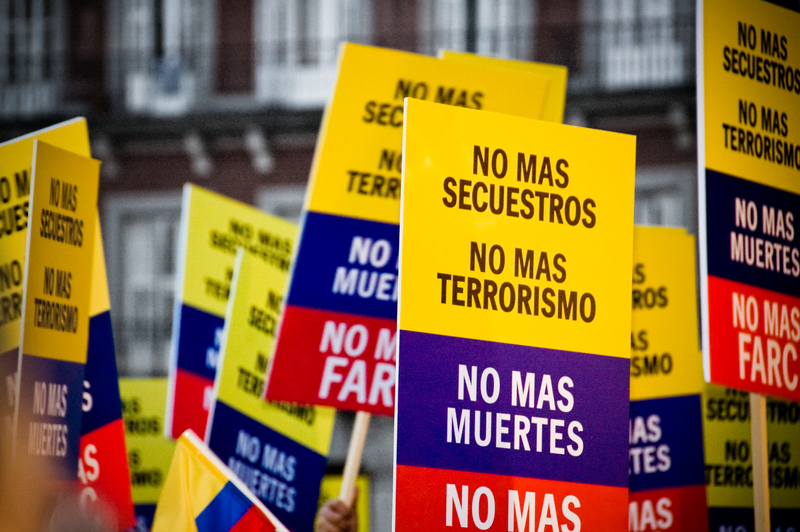 The original accord, made earlier this year, was rejected by Colombian voters on October 2. The renegotiated text aims to win over ‘no’ voters but already faces opposition. Should the deal fail again, the ceasefire may break down and return the country to war. Whether this can be avoided will depend not just on the FARC and the government, but also their opponents. The FARC formed in 1964 as the militant wing of the Colombian Communist Party. The country’s largest rebel group, the group has an estimated 8,000 fighters and thousands more supporters. Based in rural regions, FARC champions wealth redistribution and opposes multinational corporations and foreign governments, particularly the US. The FARC has relied heavily on violence to pursue its goals, most notably bombings and assassinations. Its operations have been financed largely by levying Colombia’s multibillion-dollar cocaine trade. Almost a quarter of a million people have died in what is the Western hemisphere’s longest-running insurgency. 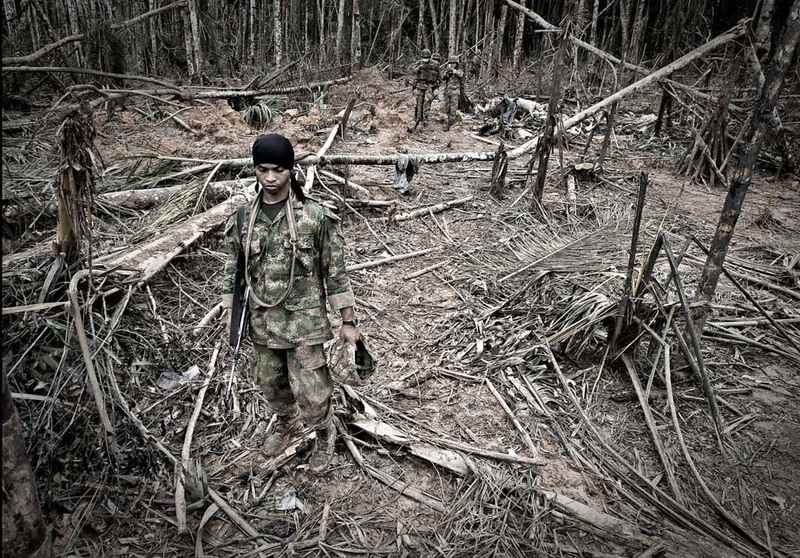 After a prolonged government offensive, the FARC entered into peace talks in 2012. 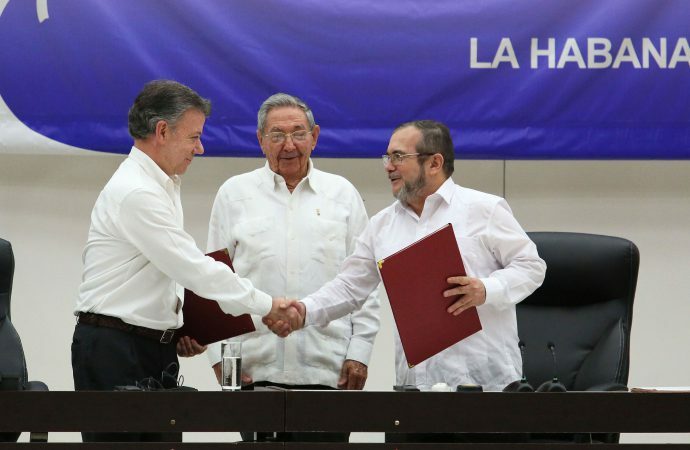 Although negotiations were complicated and frequently delayed, on September 26, President Juan Manuel Santos and Rodrigo Londoño – the FARC’s leader since late 2011 who’s known as Timonchenko – signed a permanent ceasefire in preparation for peace. The original peace deal covered five key issues: agricultural reform, abolishing the illicit drug trade, reparations for victims, the FARC’s demobilisation, and its political participation. The latter two points generated significant public opposition. Under the original deal’s terms, FARC fighters who confessed to war crimes would have avoided prison and instead served eight years of undefined restrictions to their liberty. The deal would also have seen the FARC morph into a political party, represented by 10 unelected seats in the Colombian Congress until 2026. Despite polls suggesting two-thirds of Colombians supported the proposals, the ‘no’ vote won by a narrow majority. The defeat is largely attested to a belief among Colombians that the deal was ‘too soft’. A disinformation campaign and the FARC’s initially successful push for recognition of LGBT rights in staunchly Catholic Colombia also contributed to its failure. The setback revitalised the political fortunes of the deal’s leading critic, former President Álvaro Uribe. After the shock result, Santos and Timochenko agreed to maintain the ceasefire and renegotiate the treaty. By November 12, a new deal was struck, in which the FARC agreed to surrender their assets to compensate victims and confine its fighters to rural areas for five to eight years if they confessed to their war crimes. The new text no longer refers to LGBT rights, nor offers amnesty to drug traffickers who ‘profited personally’, and will be enshrined in law for twelve years rather than written into the constitution. As a result, the government has been freed of its obligation to hold a referendum and it seems likely the deal will instead be voted on in Congress, where Santos’ coalition holds a majority. Given the FARC will retain their 10 unelected seats, Uribe and his party will likely oppose the legislation’s passage, however, they lack the numbers to forestall implementation. Concerns still surround the deal’s outcome. The first consideration is if Santos is unable to pass the legislation, or if it is put to another public vote and defeated again. With little room left to negotiate, the FARC’s fringe elements could reject the process and break away from their peace-inclined leaders. These radicals could resume the conflict and jeopardise the fragile ceasefire. Breakaway FARC combatants remain a possibility even if the deal is implemented. Colombia sources almost half the world’s cocaine and FARC controls the majority of Colombia’s production through autonomous affiliates, who may renounce peace to retain their personal revenue stream. The FARC are not the only rebels group operating in Colombia. The smaller, left-wing National Liberation Army (ELN) said in September that it too sought formal peace talks with the government. However, if the ELN sees the FARC is unable to achieve peace, the group may abandon the concept and resume its fight. The ELN could also draw in defectors from FARC, including their territory and drug production facilities. The United Self-Defenders of Colombia (AUC), a right-wing umbrella group for anti-FARC paramilitary forces, is also active throughout the country. The AUC enjoys support among extorted drug lords, the elite, and local communities where official security forces are lacking. However, it has been condemned for murdering left-wing civilians and its close relations with drug traffickers. Uribe himself has alleged ties to the AUC – perhaps no surprise as FARC fighters killed his father during an attempted kidnapping in 1983. If the AUC rejects the peace deal, it could renew conflict by launching attacks against the FARC, as its predecessors did in the 1980s when hundreds of FARC rebels were killed after disarming. Alternatively, the AUC could turn on Santos’ government, replacing the left-wing insurgency with one from the right. Even if the AUC accepts peace, some elements may continue their kidnapping and extortion activity for personal gain. Finally, the political dimension remains an important consideration. As president from 2002-2010, Uribe launched an unprecedented offensive against the FARC, which halved the group’s strength and contributed to its decision to pursue peace. However, it also led to widespread human rights abuses. Since a public falling out with his protégé, the peace-inclined Santos, Uribe has led a vocal opposition. The success of his ‘no’ campaign in October has regalvanised his political career. In light of the new deal, Uribe could continue arguing the government has been ‘soft’ on the FARC and further undercut Santos by labelling a legislative decision on the treaty as undemocratic. If Uribe and his party can use these arguments to gain control of Congress in 2018, he could attempt to undo the peace deal. Any subsequent actions taken against former FARC fighters – exiled in their rural heartland as per the deal’s demands – could prompt armed opposition and reignite the conflict. It would also likely involve the arrest of the FARC’s leaders, by then members of Congress, a move that could undermine Colombia’s democracy. A positive outcome for the Colombia-FARC deal remains possible. However, the failure of the Colombian population to ratify the original treaty was the loss of a golden opportunity to settle the conflict as amicably as possible. Where the new deal will lead the country is unclear but plotting a peaceful path between the demands of domestic politics, the FARC, the ELN, and the AUC, will be an almighty task.